I have tried for a week to get this baby to download. With a little help from an editor at Vogue Knitting (thanks Renee) we have launch. Today is my birthday and this is what I received in the mail. Life is full of serendipity, don’t you think? I just wanted to share how proud I am of this little gem. And the added coolness that they used another shot for the background of the Table of Contents. 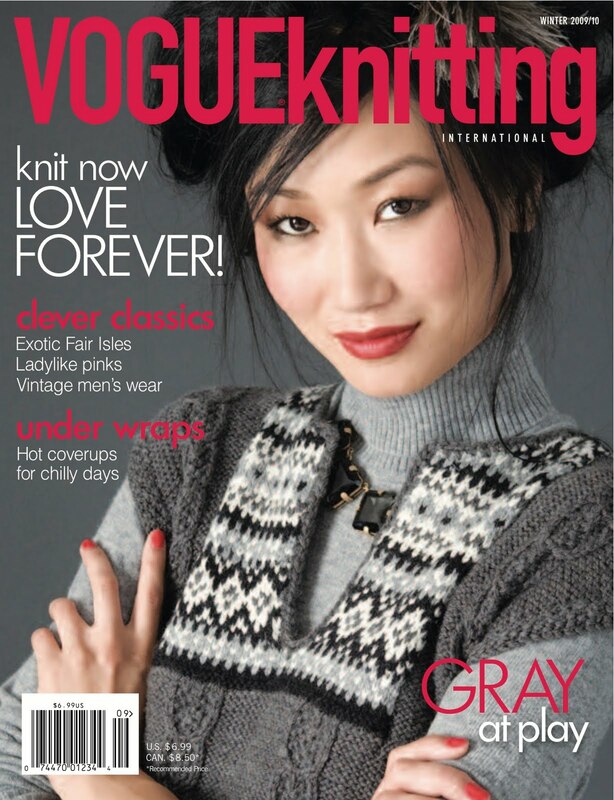 This has been an amazing experience, thank you everyone at Vogue Knitting. This is a very detailed Fair Isle sweater (perhaps I shouldn’t share that the original name for this was “Chicken Feathers” and was inspired by some crazy chicken buttons I found at Maryland Sheep & Wool years ago, does not seem very Vogue-like), with steeks at the front, the armhole openings, the neck opening, and the sleeve caps. It sounds very difficult, but once you have cut one steek each succeeding steek is sooo much easier, so why not knit a sweater that will give you ooodles of practice??? The actual stranded colorwork couldn’t be easier, a nice tiny repeat, no big long carries to worry about and only 9 colors, I think, I don’t have the pattern right here. So give it a go, you’ll like it. Happy Birthday! What a wonderful birthday gift. Congratulations on having your sweater design published, by Vogue, no less. It's really beautiful and I aspire to be skilled enough someday to execute it! Congratulations! It is beautiful! Happy Birthday to you!